Attached are some pictures. The spring is a mod'd - upgraded spring which will roughly double the fuel pressure of a turbo engine which should equal faster element filling. Shipped CONUS ONLY. $40 each. I prefer only one (1) per customer so that the product will spread the word so to speak. These are already rebuilt and ready to go. It takes about 5 minutes to install. To put this in perspective, many folks buy 5 to 6 cans of diesel purge per year which really doesn't do a whole bunch. For the same amount of money and a lot less time, you will feel a difference in your performance which is LASTING. I know because I have a tired 300D NA engine and I installed one of these and it made a very noticable difference in performance. I strongly suggest turbo OM617.9XX engines only. I only have nine (9) left. A great deal of R&D went into these and the buyer should notice and appreciate that effort and effect. Why do you suggest this for turbos only? Pardon my ignorance, I've never heard of an overflow valve, where does it go? It will work with the 300D NA (I have one in my car). However, it's most or more noticable in the turbo. So, I guess I should have been a smidge more clear. My bad. In other words, it will work in your car also. I popped mine in about a month ago and it was noticable -- even for a 300D NA. I am targeting the turbo folks and mod'd turbo folks since it's a really nice upgrade. Behind the IP, just follow the front-most line - banjo fitting. I will get a snappie tomorrow. I am selling a total of 9 overflow valves. What is being offered for sale is one overflow valve for $40 shipped CONUS and I have 9 of those for sale. Each valve is already re-built with one spring (mod'd spring). 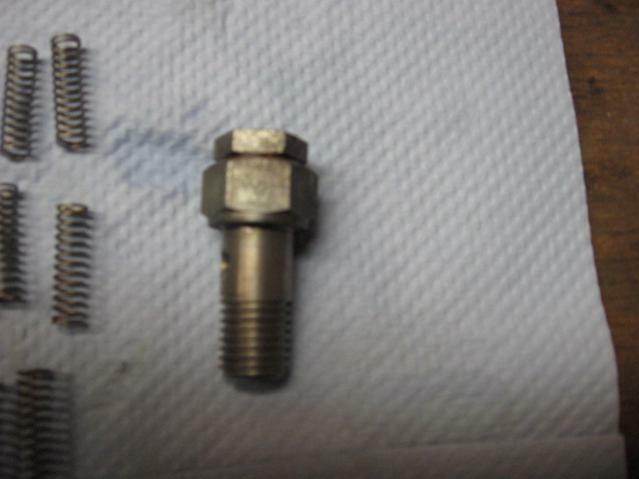 Each valve consists of the banjo-like bolt, ball bearing, mod'd spring, copper washer, and end cap (the 5 pieces you see of the right in the 2nd picture). Found this on Google Images. It's letter "A" in the snappy. Hope this helps. The spring goes inside the body of the banjo-like bolt. Each valve is already assembled, ready to be installed. 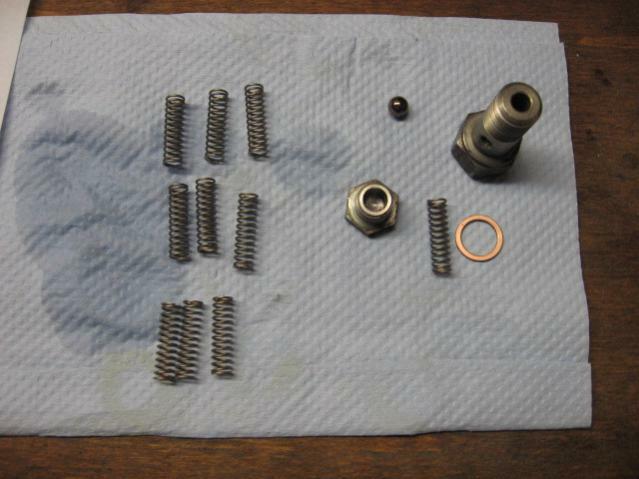 As for assembly, in goes the ball bearing, then spring, then copper washer, then end cap. Yes, it works also on OM603 and OM606 engines. It works on N/A as well, but I suggest its application with turbo engines. The spring is stainless spring steel, calculated for the Mercedes engines and fatigue tested. With the spring (actually rebuilt valve) a turbo engine will get more fuel/power without modding the pump on a bench. (It works on a NA engine as well, but as I indicated, the most gains are felt on a turbo engine). how much omf will I feel?Does it let more fuel in?How to send the money? PayPal is preferred -- just like my injector service. You will feel a difference. I felt it in my tired 300D NA engine. Of course your car will not be a Porsche, but it's a noticable performance upgrade. Some folks with the 240D (4 cylinder engine) claim they run their engines without it and / or feel no difference. This is NOT for the 240D crowd. Further, by analogy, I have done a lot of injectors for folks and out of 100 sets, there's always 1 person who claims he felt really little to no difference. Of course the injectors before the R&R peed like crazy, weeped, and barely pushed any atomized fuel and with new nozzles no difference? So, the point I am trying to make is that yes, you will notice it and if you don't, then there's something else up with your engine. Hope the above, long winded response helped. Did you have any measurements of fuel pressure with this vs. a normal 27mm spring? I'm curious about this as well. It has been suggested by some who are very knowledgeable that OM606 knock/rattle/nailing is caused by insufficient element filling. 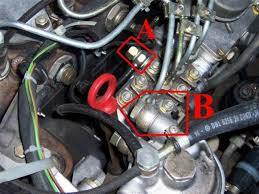 This may be poor lift pump performance or low pressure due to the weakened regulator spring. I am keeping close hold the specs. Obviously, one could meaure the PSI. I can say that the pressure is increased. However, it's not just simply adding a more robust spring to increase PSI. That is why I commented on the R&D aspect of this.